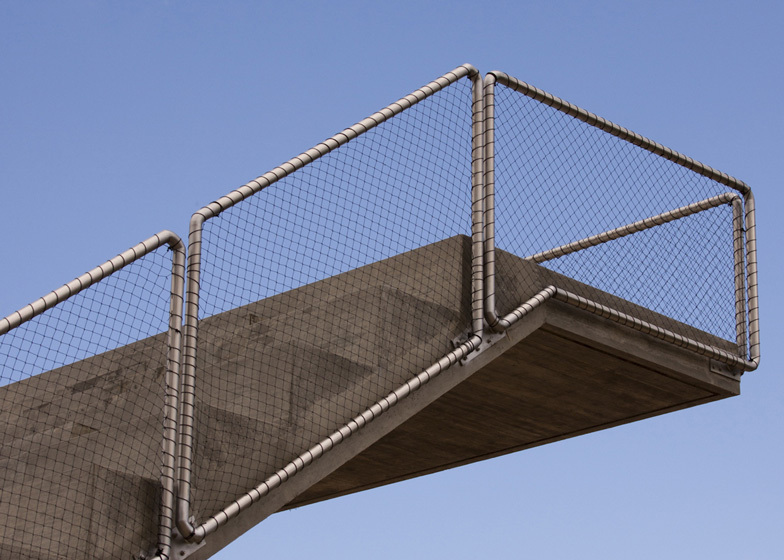 This concrete staircase into the air by Lisbon architecture studio Ateliermob functions as a riverside amphitheatre on the banks of the Tagus in central Portugal (+ slideshow). 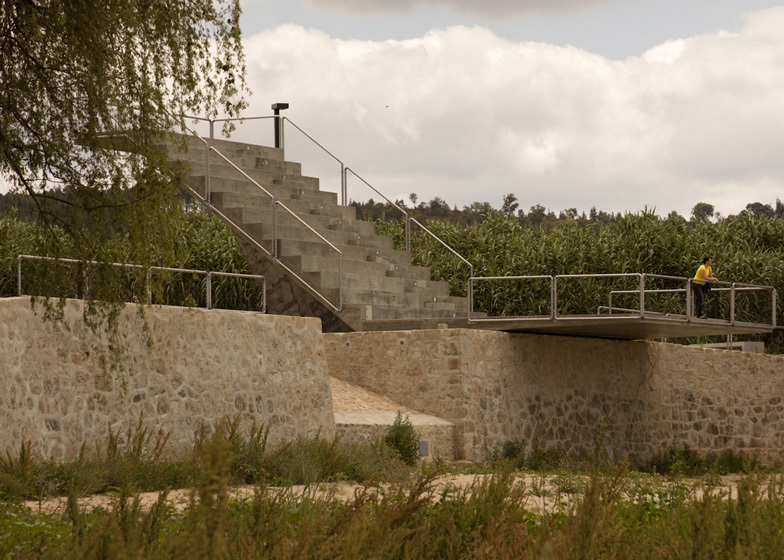 Positioned on the northern shore of the river near the village of Rio de Moinhos, the structure is built on the site of an old fishing boat dock that had fallen out of use due to regular flooding. Ateliermob's brief was to create a public installation on the site. To withstand the changing water levels, the intervention needed a solid structure that would resist decay even if submerged for a few days a year. The chunky concrete bleachers rise up in a northerly direction, facing a stage that cantilevers out across the riverbank. A telescope is mounted at the very top, while rectangular concrete benches and tables provide a picnic area on one side. "The new element wipes out the boundary between land and water, projecting itself on the river, and on a flat terrain it erupts in the air as a reference in the landscape," say the architects. 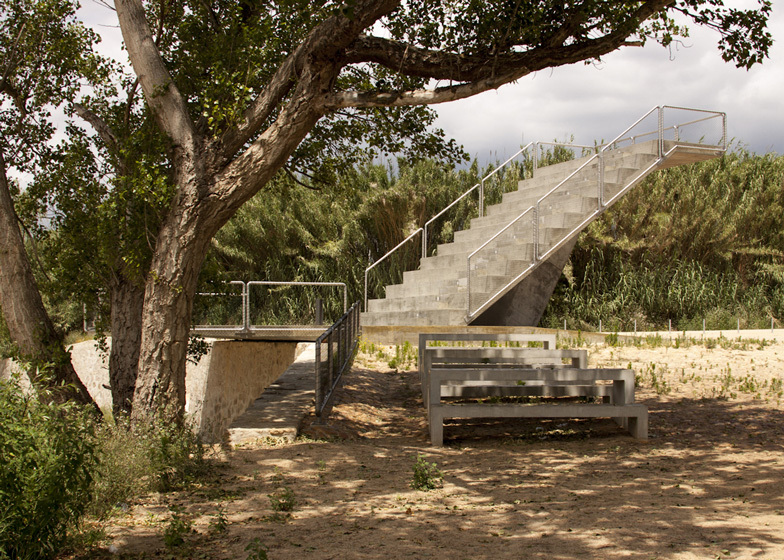 The Rio de Moinhos Open-Air Theatre is the latest in a series of riverside installations designed by Ateliermob for the banks of the Tagus since 2007. Other amphitheatres on Dezeen include a summer theatre in Estonia and a stage set in Sicily designed by OMA. Photography is by Zoraima de Figueiredo. 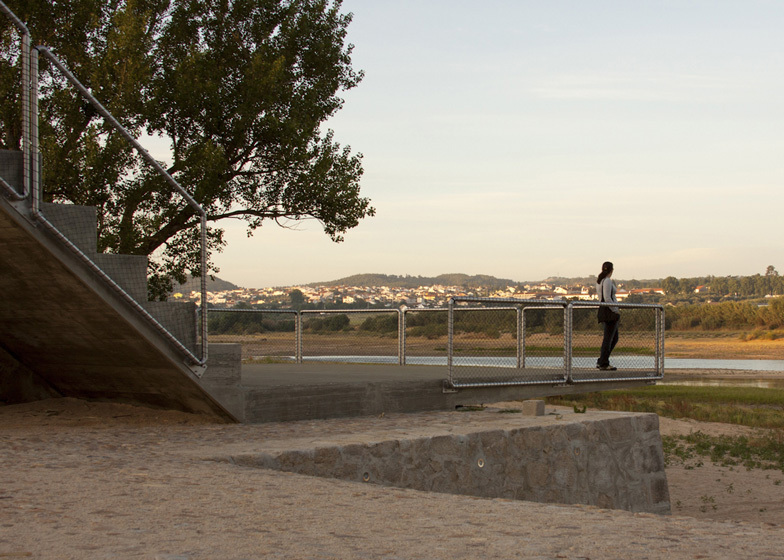 ￼Following an international competition for the banks of the Tagus River in four counties in central Portugal where ateliermob got the first prize, they were asked to design three projects in the municipality of Abrantes. Located on the right bank of the Tagus River, near the village of Rio de Moinhos, the Cais das Barcas served as a fishing boat dock and transported people and goods between the two banks. 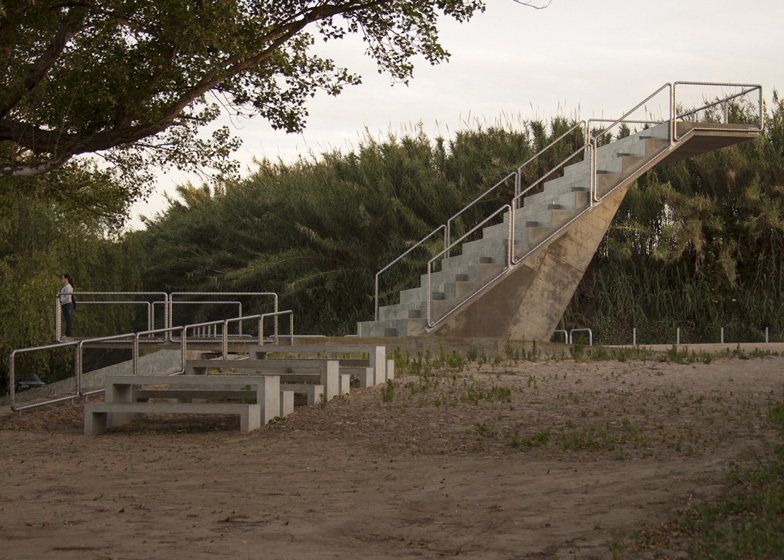 Over the years, that space lost its essence, both due to the nearly non-existent maintenance as the constant flooding of the Tagus (the height of the pier is +18.00 m, and the 1979 flood overflowed the river, which rose to 31.00 m). Following a study of the dynamics of the local population, which can be characterised as having intense activity in recreational and popular associations, and it was understood that an outdoor space that could serve as an informal area for groups and communities and that could withstand submersion for a few days of the year. The new element wipes out the boundary between land and water, projecting itself on the river, and on a flat terrain it erupts in the air as a reference in the landscape. The project seeks to recreate a place that spring-starts from the renovation of the pier, adding new collective reference meanings and uses. A new space for the local people that acts as a gathering place for the community or as an idyllic meeting place. The entire area around the auditorium, parallel to the existing dock, is redrawn maintaining its natural character, yet providing it with urban furniture – benches and tables for a more effective use by the population. 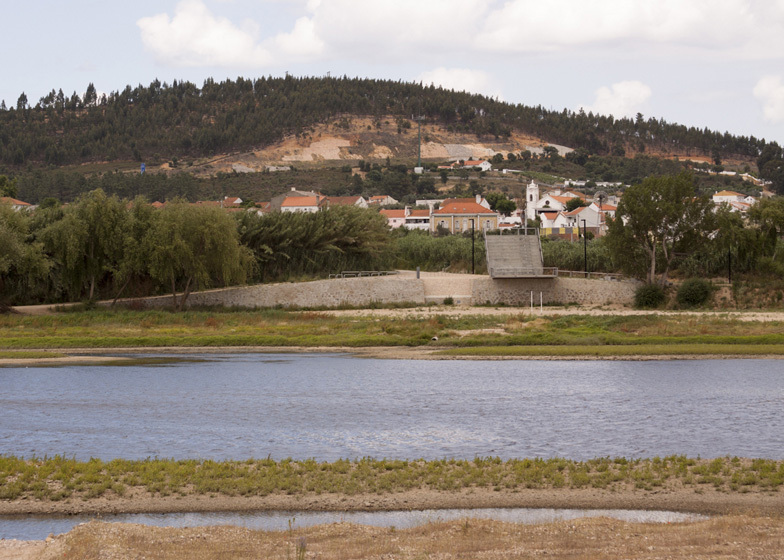 Rio de Moinhos has experienced a difficult relationship with the river, noticeable its urban morphology - from times of flooding to times of drought. Every year, during the rainy season, this structure may become partially submerse. The proposed structure seeks to reclassify the area, creating a new meeting space for the local community. 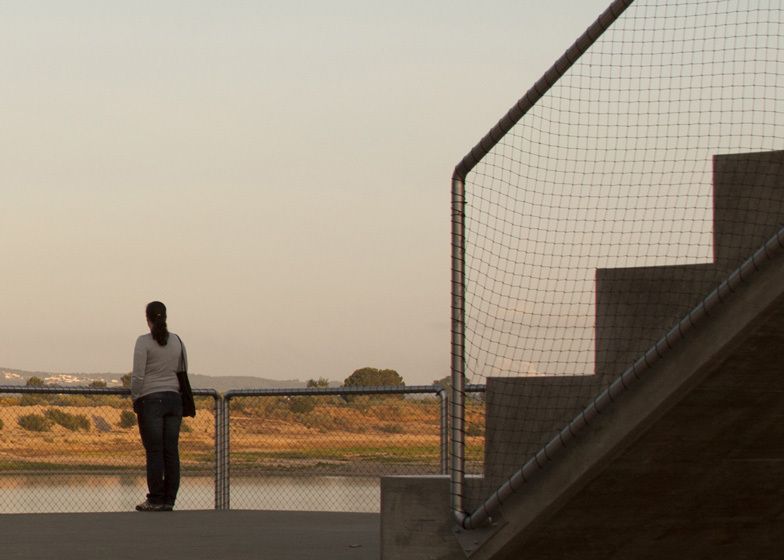 When no events are taking place, this amphitheatre will be ideal to contemplate the river, the landscape and from its highest point, Rio de Moinhos.